I always like to introduce you to artists who, I think, have been marginalized in “official” art history surveys of western (or non-western for that matter) art. Because Paris was has been considered the “art center” of the western world in the first three decades of the 20th century, it is hard to learn about certain artists outside of that sphere, especially British women who emigrated there. The atmosphere in Paris in the first decade of the 20th century was so rich that it inspired many artists to bring their work to maturity. Being in a rich artistic environment wherein artists share ideas and techniques and talk about the latest trends has got to be one of the most excellent experiences! Well, Gwen John lived through the period when Picasso was experimenting with Cubism, and when Matisse, Brancusi, and Modigliani were also shattering the ideas of traditional art. However, she remains quite apart stylistically. 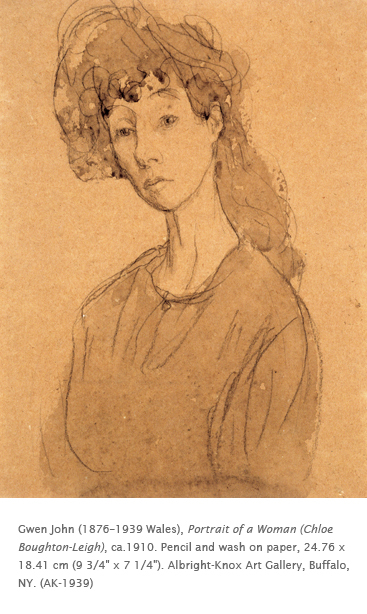 Gwen John was the sister of an influential artist of the academic bent with Pre-Raphaelite tendencies. In 1895 she went to the Slade School of Art in London, where she honed her skills in drawing. Drawing would be the hallmark of her oeuvre. She moved to Paris in 1904 and became involved with the sculptor Auguste Rodin (1840–1917). It does not seem that she drew any influence from Rodin, except for, perhaps, the pathos that is evident in her painted and drawn works. After 1910, she concentrated on still life, interiors, and, especially, single figures of women. This portrait is one of many that John did of her friend Chloe Boughton-Leigh. In the painted portraits of Boughton-Leigh, we are reminded of British Romantic painting, particularly the links to Mannerism of the Renaissance. Also, in many ways, the elongation of form reminds one of Modigliani, who was working in Paris at the time. However, the melancholy infused in the figure is seen in many of John’s portraits of women. It could represent her unhappy relationship with Rodin, but it may also relate in a broader sense to the melancholy that infused European Expressionism, a period in European history that was unsettled and on the verge of war. Gwen John is a unique, singular voice in British painting at a time when all the focus was on Paris (Picasso, etc). Her work is a contribution to Expressionism that is little studied because most of her work was figurative. I find her work to be the British manifestation of Expressionism. Her typical subject matter of women, isolated on a blank background, speaks volumes about the state of women at the turn of the twentieth century, on the cusp of acceptance, and yet not quite there. Activity: Draw a portrait of a classmate expressing feelings or mood. First draw the shape of the sitter’s head large on the paper. Be sure that the eyes are in the right spot by looking at the classmate. Add features to show expression. Use pastels, crayons or colored pencils to fill in the portrait. Add background details to help heighten the expression. Color choices for the face can also heighten the expression. Thank you for the post about Gwen John, I was so stunned by her masterpiece Girl with a Blue Scarf, to me it is a true and finished immortal work of the most exquisite form of art. She is very talented and gifted painter to me, her works are just breathtaking, really and truly enjoyed them. Thank you for telling everyone about her, she is worthy of it for sure.